Back in July of last year I made a post Man of Mystery, Donn P. Crane about a childhood idol, the illustrator Donn P. Crane. As I mentioned in the post, Crane’s magical illustrations sustained me through a challenging childhood, providing me with a glimpse into a world far removed from my own grim reality. I feel deeply indebted to the man, his work encouraged my interests, developed my taste, and broadened my horizons. Once again I say thank you Mr. Crane. I was shocked to discover how little information was out there concerning Donn P. Crane, a very prolific artist, of immense talents,had left barely a trace. I had hoped to remedy that in some way with my modest post. I was thunderstruck when his grand-daughter Ann contacted me with information concerning this great artist. That she happened to contact me on my birthday only added to my joy. I really enjoy this image, he is so sweet faced, seems quite kind; his work reflects that tenderness. I must confess I hesitate to release these images, my greedy nature wishes to hoard the treasures. That wouldn’t be fair to Crane’s legacy. 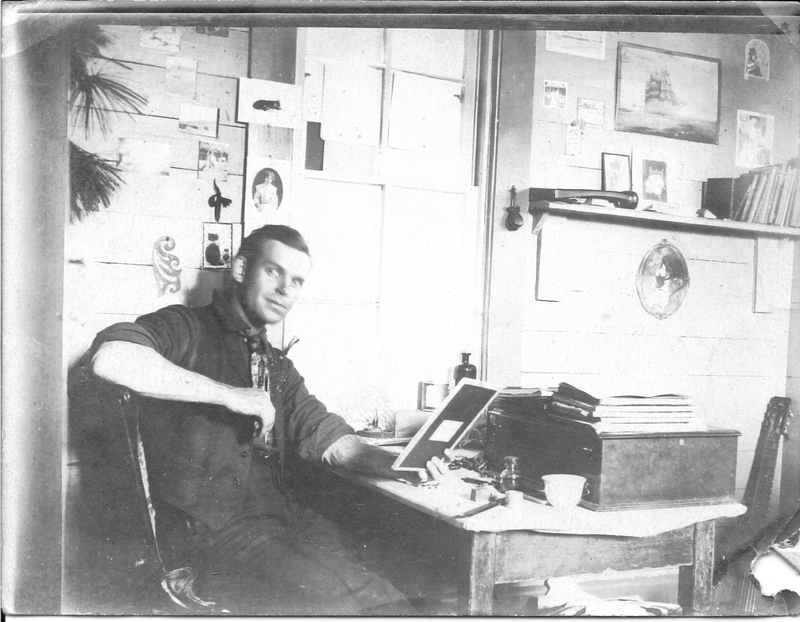 From his grand-daughters telling, Donn P. Crane was born in Missouri in 1878, the son of Day Otis Crane. Day Otis Crane, a failed miner, was unable to provide the stability so essential to childhood; perhaps young Donn retreated early on into the magical world of illustration for a sense of security and solace. I hope so. From Missouri the family moved to Washington D.C. when young Donn was two; another move, this time to to Idaho was where a sister and two brothers were born, unfortunately the brothers did not survive. The Crane family ultimately settled in Chicago sometime before 1890. Young Donn was involved with a theatre troupe, this early involvement with the stage is clearly reflected in some of his more dramatic illustrations. Upon his mother’s death, Donn moved ,as so many artists have, to New Mexico. Amidst the grand landscape Donn found inspiration, I imagine it was particularly liberating after the restrictions of monetary deprivation and urban chaos. 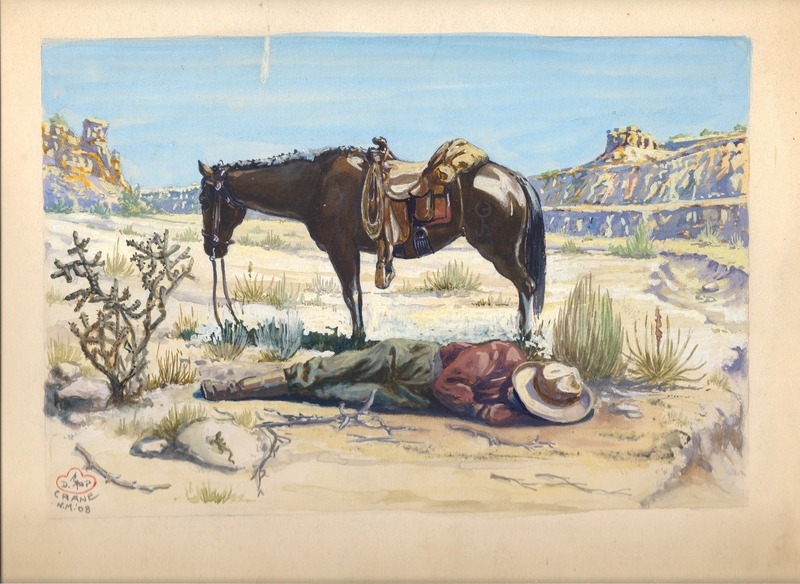 The following illustration, provided by the family, is from the New Mexico period. It is quite a gem. 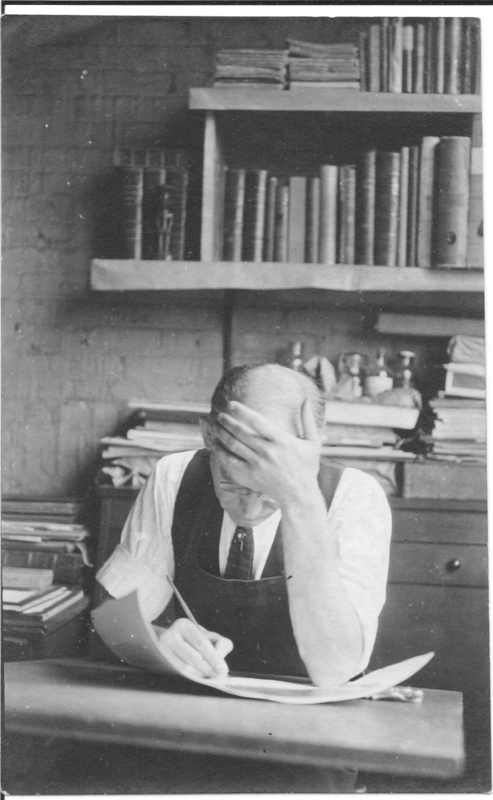 Donn did return to Chicago in 1909 where he began his long and quite prolific career. The following image from Chats with Color Kins 1909 was his first professional illustrating job. The book was published by the Theosophical Press of Wheaton Illinois. Donn married in 1911, began his family with a daughter in 1912, and a son , also named Donn Philip Crane, in 1915 ( the father of Ann). What is so impressive, and frankly dis-heartening as an artist, is that Donn was self taught. Ann describes finding self improving books on art instruction (in German) and puppetry amongst his belongings. His skill was so advanced, it is difficult to comprehend that he was without training; clearly a keen observer. The following image is tagged “Brain Storm” by the family, it is a touching image. I love the carefully stacked volumes, possible sources of inspiration? Donn Philip Crane senior died in 1944, not receiving the laurels he deserved, but he did leave behind a family devoted to preserving his legacy. I sincerely thank the Crane family for sharing these very special treasures. This entry was posted on January 6, 2011 at 8:35 pm and is filed under 20th century, Chats with Color Kin, Divine Comedy, Donn P. Crane, Faust, My Book House. You can follow any responses to this entry through the RSS 2.0 feed. You can leave a response, or trackback from your own site. We are such kindred spirits! As a kid, I used to pore over my own set of My Book House books just for the illustrations. I love that three color printing! LOVE it! And now I know the story about one of the main artists! Thank you!! So happy to meet a fellow devotee of My Book House, I haven’t until you. I mention in my first post concerning Crane my dislike of the 3 way coloring, i have matured into loving it. I am so pleased to have met Ann Crane, she has been amazingly generous. I plan to open a FB page devoted to Donn, will keep you posted. That is amazing-a wonderful story. Thank you, I think he is an amazing artist, and from what i have gathered a wonderful person. Well I’m quite jealous , would love to see the image if you wish to share it. I am in regular contact with Donn’s grand-daughter ; I’m sure she would want to see it. He is a marvel, I’m glad you enjoyed the post! I think I have made my affection for Donn and his work quite clear. I hope you and Donn’s other relatives can connect. I of course, as a Donn P. Crane devotee, would be interested in anything concerning this great artist.I hope to one day write a paper on this overlooked talent. I am the Great-Great-Great Niece of Donn’s father Day O. Crane. If you go to Biographical Wiki, there are pictures of Donn’s father and mother that my brother shared with my cousin to post online. You may have already been there. Thank you again for recognizing Donn. Thank you for posting this…..I have two Donn P. Crane items in my collection. These have been passed down through the years to me. One is a beautiful water color of a stage coach in the English countryside. The other is a Christmas card with a Dickens-ish theme of my great grandparents and their three daughters…one is my grandmother. I actually took these two items to the Antiques Road Show in Madison,Wisconsin a year ago and the gal that I saw knew nothing. In fact I knew more than she did. I believe these both to be from the mid 1920’s but there is no date on either. I will forward this to Donn’s family, they might be interested in knowing of his private commissions. As you know I think he is a marvel, thanks for sharing , would love to see the images . first, I rather not say my name. I like pen names better. I am a direct descendant of my talented great grandpa. It is really clear that he has passed down artistic talents. I am a young learning artist but I self taught myself. been drawing since I picked up a writing utensil. I practice drawing ~5 or so hours a day. As a goal, I want to make my family name a proud one and well known, something that should have happened to my great grandpa because of his exquisite art/illustrations, however this did not happen. But I want it to happen, and I’m going to make it happen. His hand and observance has gone to me. Well, call me over confident or arrogant, but it’s just the passion of a youthful artist. But more importantly, as long as I have a hand and can be able to draw, I am grateful and happy. It’s too bad I only have one real piece of artwork from my g-grandpa. Seeing and feeling are two completely different things. It is always a pleasure to meet a fellow artist, like you I am deeply influence by Donn’s work, you have the added benefit of sharing Donn’s name;it would be most fortunate to inherit his talent. Donn made a tremendous impact upon my work, and like Donn ( and apparently you) I am self taught. It is only now at mid-life that I have decided to receive more formal training.I envy your confidence and bravado. If you like send along a piece of your work, I would happily contrast it to Donn’s own. would make for an interesting article. As you can see from the multiple responses Donn’s magic impacted many, I am not alone in my admiration, nor are you. Thank you for introducing yourself. Donn Crane’s wonderful illustrations in my set of My Bookhouse were powerful inspirations for me when I was a child living on a cattle ranch. School and chores kept us busy, but after all the work was don, back in my room, I could retreat into Donn Crane’s world and the fabulous stories in My Bookhouse. I’ve always thirsted for more information about him, and when I discovered this site, I was thrilled (!). The wonderful Bookhouse books gave me a true love for reading and a deep admiration for the artists who illustrated them. Donn Crane was my favorite. 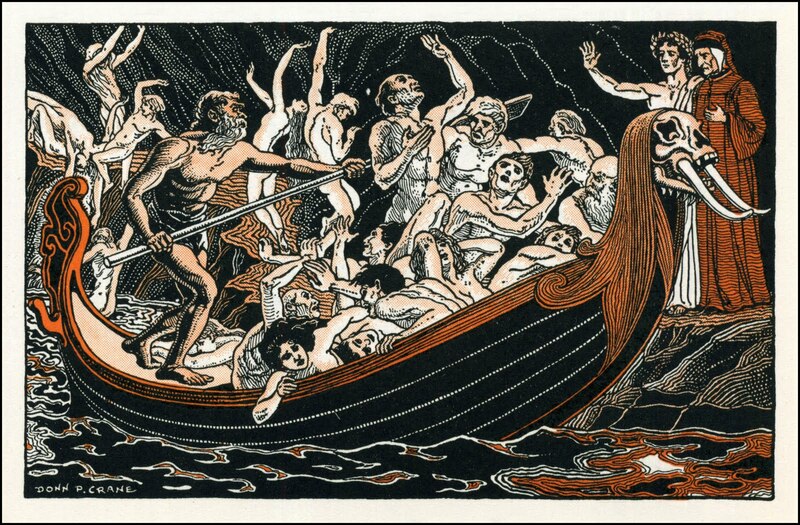 His illustrations were so rich in detail, so realistic…yet lush and baroque. I couldn’t get enough of them when i was a child, and would often just thumb through My Bookhouse volumes just to gaze at his work. Only two volumes survived our family of 6 children, but in the ’90’s I discovered EBAY when I searched for My Bookhouse, hoping to find a set for sale. I was able to buy the same set I was raised on as well as some very early sets. The joy of having Donn Crane back in my life again was …. great ! It’s a pleasure to learn that others share my admiration for him and the love of his work. Thanks for all the information you have provided and for this meeting place of Donn Crane fans! I am always tickled to meet a Book House loony, marvelous aren’t they. as I mentioned I have my mother’s set, which I treasure beyond measure. I would like to collect earlier versions. Please pop into Babylon Baroque again, always nice to hear from readers. I still treasure my childhood set of My Book House. It was Donn P. Crane’s illustrations for The Ring (Giants! Swords! Dragons!) that turned me into a Wagnerite and, by extension, an opera nut. You should construct a Wikipedia page for this artist; I think you have more info on him than any person living! Donn Crane had a similar effect on me, I see his illustrations when I experience the Ring. Pure magic.We have a lot to thank him for. I should consider the page, he deserves it, I will need to run it by his family first of course. My love for Donn is great, he is my mythic grandfather in so many ways. I have a complete set of these books from 1937 and except for Book 1 they are in great condition. That must be the book that was read the most to my older brothers. The books are wonderful and the illustrations are amazing. I had never heard of this book series nor of this artist until today, January 7, 2012, when I was poking through boxes of unorganized books in a used book store that was more like a storage unit than a store. 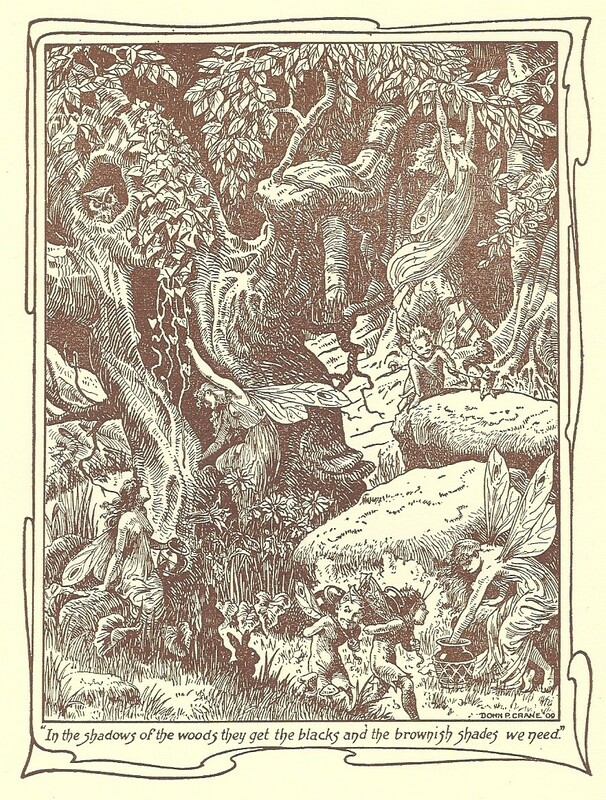 I was immediately enchanted by the illustrations in the book, My Bookhouse – Through Fairy Halls, and bought the book. I googled the artist’s name and found your blog. Thank you so much for posting this info on his life. I hope it helps bring more attention to Donn P. Crane’s life and art. I envy your newly discovering Donn’s magical work, I know you will continue to enjoy it! Thank you for the information. I grew up reading My Book House and fell in love with Donn’s illustrations. I teach 6th grade and the other day I was showing some drawings of Mesopotamia which was part of a curriculum packet. As I was turning to the last image the class was thrilled with the picture of an Aztec city. What really caught my attention is that I felt I knew the image even though I had never seen it before. When I saw the illustrator’s name in the lower corner I instantly knew why…Donn P. Crane. I pulled by Book House book from the shelf and shared with my students for the rest of the day (150) all about my love for this artist. Tonight I thought I would look for information on him and came first to your webpage. Thank you for taking the effort to do this for all of us who loved his art work. Always happy to hear from another Crane acolyte. He certainly had a distinct hand didn’t he?, when one is familiar with his wonderful work you can identify it almost immediately. Could you possibly provide a link to this Aztec image? I am working on a series of paintings ( see http://www.boondocksbabylon.wordpress.com for work in progress) which are based loosely (very loosely! )upon Mesoamerican art and design; I would love to see dear Donn’s spin on this culture. Thank you for your kind words, I’m happy the post pleased you. My girls loved their My Book House set, unfortunatley they did not survive our many moves. Quite a few years ago I found 4 Donn P Crane framed black and white prints from 1930 but they are quite different than the other works. Each is a famous European cathedral: Notre Dame, Verona, Colgne and Westminster and they are smaller than an 8×10. I have no idea if they are etching prints but each is in it’s original frame with brown paper glued over the back. The original paper is a creamy color but I don’t know if that is just age. I think they are wonderful; they were $2.50 each at a Goodwill. Well it seemed like you received quite a good deal on the Crane art, congrats. Donn, from what I am learning was incredibly versatile. As per Book House, they are still very available, my favorite little used bookstore here in San Diego has three sets, differing degrees of wear and tear , but reasonably priced and a treasure to own. My own set was my mother’s, she must have been very careful with it or didn’t enjoy the set very much, as they are pretty pristine. Take care sand enjoy your treasures . Thx for sharing … I am in a thrift shop looking at (planning to buy) a signed print by this artist. It is dated 1930 and I was curious, as I liked it so and was unfamiliar w/the artist. I am getting an awesome print with a real history for pennies! Have a lovely day! your enthusiasm made me look at my fathers set of Bookhouse for children, 1920, and you are right what fantastic imagery. it was a lovely escape to fairyland ! And I love that the stories have not been dumbed down, the evocative language is in perfect harmony with Crane’s work. Just discovered Mr. Crane in a 1938 book. Beautiful drawing of a Victorian father reading to his children, in a story entitled, “When My Daddy was a Boy.” It’s sumptuous and baroque and I immediately had a color photocopy made for framing, and am now researching sources for other work of his. When I saw this drawing, I knew that we were kindred spirits. Would that he had illustrated Walter de la Mare. He would have been ideal for de la Mare’s stories. How wonderful to find this site! I’m another one who fell in love and wonderment with Mr. Crane’s illustrations during my childhood. I spent a very lonely time living with my grandparents as a child while during my mother suffered through a depression. Her childhood books were my friends and sustainers. I’m happy to report that I still have them all – and the My Book House books are a first edition! I was looking him up today because I’m making paintings of my childhood memories and recently finished one called My Mother’s Books. Thanks for this. I’m excited about exploring the blog. Right up my alley!! I’m happy. Pardon my delay in responding , this blog is essentially closed and I do not monitor it often enough . My mother also suffered from debilitating depression and My Book House rescued me from the household despair . 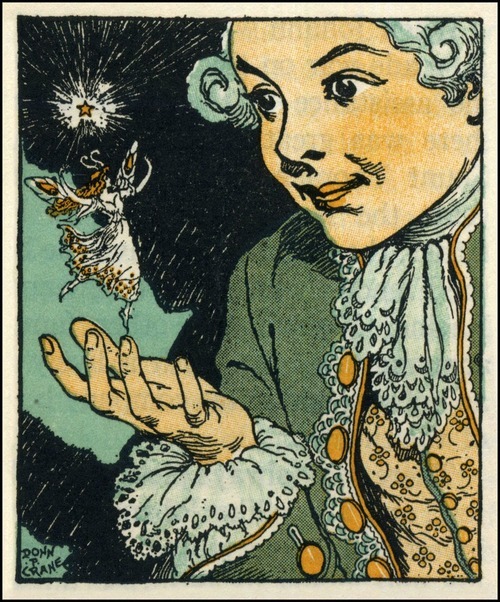 Crane’s illustrations to this day inspire my work . 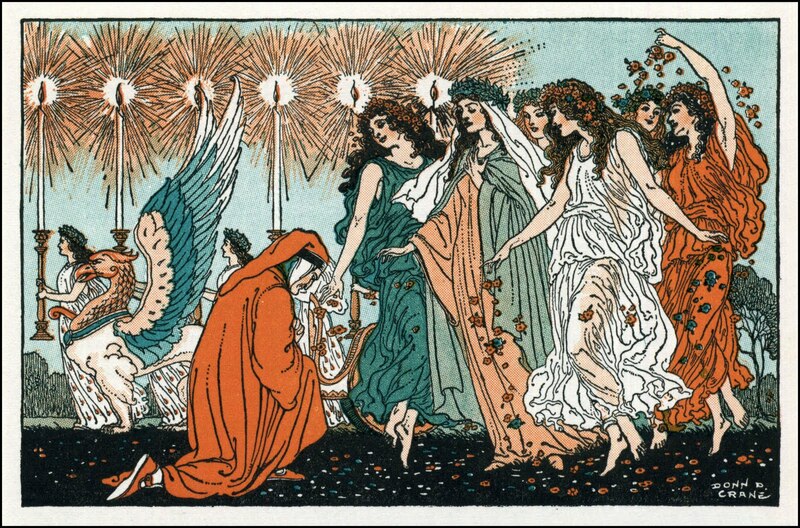 His beautiful illustrations in the history series My Book of History by Beaupre and Baum stirred my imagination as a child. In this series there are hundreds of his illustrations from Egypt to the jungles of Yucatan and everywhere in between. I still think it is the best illustrated history series I’ve ever encountered. Thanks Donn for creating worlds that I still marvel at today. I couldn’t agree more . I have that series as well . It is quite extraordinary. I need to take another peek for inspiration. Thank you for the research. I too, am quite an admirer. His technique and artistry are Devine. He was a marvel , completely influenced my life.